Luxury Villa in Kleismata. A truly special place where the mind relaxes and the senses are completely spoiled. Luxury Villa offering a high standard of accommodation in a beautiful setting of Trapezaki, boasting the Ionian Sea and the amazing views of Aenos Mountain. Villa Rosa is a family run business, set in one of the most picturesque settings on Kefalonia Island. Villa Marsia offers a high standard of accommodation in a beautiful setting of Travliata, surrounded by green gardens at the foot of St George's Castle. Villa Nora is a two-bedroomed villa offering seclusion and lovely sea views over Trapezaki bay as well as being ideally situated for shops, tavernas and local beaches. 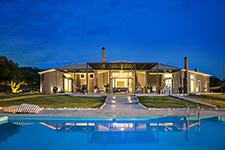 Villa Saluto with its tranquil, sun drenched location overlooking the magical Ionian sea, mountains and the owner's vineyard, is a luxurious sanctuary of world class standards. 5 Bedroom Villa, perfect for family/groups. Oneira Villas are exceptionally well situated in Trapezaki. The villas are built on a large plot of land boasting the Ionian Sea and the amazing views of Aenos Mountain. Our aim is to provide holiday letting opportunities for our clients, which suit their needs at a competitive cost while offering a friendly and personal service with attention to detail. We specialise in Kefalonia holiday accommodation where our portfolio offers premium luxury villas, self-catering villas, bungalows and apartments in stunning locations in our beautiful island. We also offer car hire, transfers & independent tours to our clients. We look forward to welcoming you to the beautiful island of Kefalonia!